I never liked this soup growing up. I thought it was bland and boring, but of course my mom would always make it. I'm sorry foodies; I was a clueless child then and did not appreciate the essence of this soup. I remember throwing a tantrum one time when I was little because I did not want to eat it. My brother was like you are eating wrong! When you eat banh canh you're suppose to add a squirt of lime, extra fish sauce, and a lot of pepper. You know it's just right when you can taste the sourness from the lime and the saltiness of the fish sauce. It was perfect! Luckily I grew to love this soup but only with extra lime, fish sauce, and pepper of course. I guess big brothers are good for some things. This recipe was inspired by my friend's mom. I had a bowl of her banh canh and instantly was intrigue by her broth. As I was slurping her broth I noticed a familarity. It looks like banh canh but why does it have a hint of Bun Rieu in it? Well that's because she uses the crab paste from the jar commonly use to make the "cach" for bun rieu. I like to use canned crab meat from Costco. You can add a lot of different ingredients to banh canh such quail eggs, pork blood, and fish cakes. 2. Sauteed ground shrimp with some oil in soup pot. Add 4 quart of water to the pot, along with salt, sugar, and mushroom seasoning. Let it come to a boil and then turn down to medium for 30 minutes. Remove any residue from broth. 3. Peel the other half of the shrimp and cook them right in broth. Once the shrimps are cooked, remove and set aside for later. 4. Heat up 1/2 tablespoon of oil in a small pan. Add the minced shallot (you can use the white part of the green onions as well) and saute until fragrance. 5. 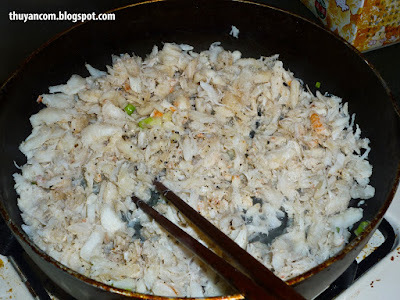 Add the crab meat and saute with the shallots. Season with a little bit of fish sauce and ground pepper. Add the crab paste and continue to stir. 6. Add the crabmeat into the broth and let simmer for 15-20 mins. Your broth is done. 7. If you like your soup thick like gravy, you want to have water and tapioca start handy. Some people like to add the noodles directly into the pot but I can't risk overcooking the noodles. I prefer to transfer a portion of the broth to smaller pot and prepare individual bowls. Bring the pot to a boil, add shrimp and noodle and let cook. Dissolve about 1-2 tablespoon of tapioca with enough water. Add this to your broth to thicken the broth. Once the noodle is soft enough to eat, transfer to bowl immediately. Top off with green onions, sliced onions, and cilantro. one of my favorite dishes with dungeness crab! Are these the clear noodles? I can't tell.. those are my fave! 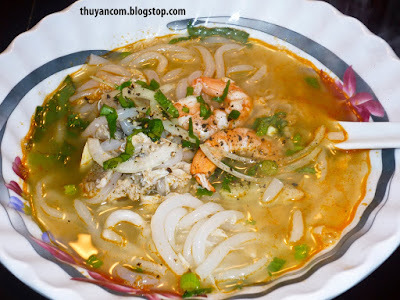 I LOVE ALL KINDS OF BANH CANH!!!! Thanks for sharing Thuy, I'll be making this next week no doubt. I'll let you know how it turns out. No these noodles doesn't turn clear but still very good! OMG Thuy,I never told you but the recipe turned out great great great,hope things are going well.